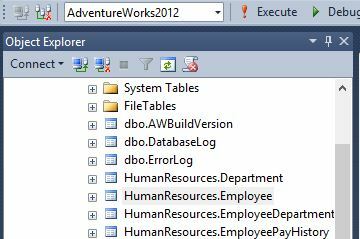 Synonyms give us an extra layer of abstraction in SQL Server if we don’t want to expose our meta data. Synonyms unlike view can encapsulate tables, view, stored procedures, user defined functions but it cannot abstract other synonyms. Now if we query the table as one part name “Employee” it is going to work. The problem with synonym is there is no schema binding like view that means we could drop a table while having a synonym pointing to it and we could create a synonym for a table that does not exists.